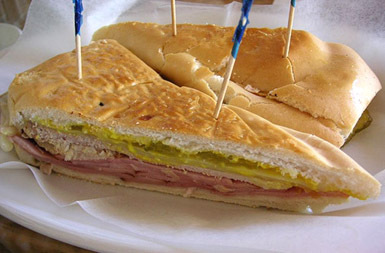 ABOVE: A traditional Cuban sandwich from Larios restaurant in Miami. Carlos Miller is a reporter who operates Magic City Media and authors CarlosMiller.com, a blog about Media, Activism, and First Amendment issues. Carlos lives in Miami, Florida. In this article, he takes a look at some Cuban food basics you may not know. As a Miami native, one of the things I missed during the ten years I lived away from the Magic City was Cuban food. And I’m not even Cuban. But I grew up in a Cuban neighborhood so I developed a deep appreciation for cafecito, pastelitos, croquetas, bistec empanizado and vaca frita. And don’t even get me started on Cuban bread. When it’s fresh out the oven, no bread in the world compares to it. But better eat it fast because it will turn into a rock in a day or two. Most visitors who arrive in Miami discover that advice on Cuban food can be found on practically any Miami street corner. But considering that advice might be delivered in rapid fire Spanish, which to the untrained ear might come across as verbal assault, you’re better off getting your advice on Cuban food from Miami Beach 411. “Mexican food has a lot more variety because there are a lot more regions in Mexico than there are in Cuba,” said Edward Millot, manager of Taqueria Mexico on Calle Ocho. “Cuban food is basically centered around white rice and black beans,” he said. But Millot, who is from Veracruz, Mexico, is obviously biased. So I asked Cuban-born Abieo Ballesteros, who had just finished off a Mexican meal at Taqueria Mexico. So now that you know that Cuban food is going to be nothing like the taco joint from your hometown, you will treading in unfamiliar territory. That is why we tracked down one of the most credible authorities on Cuban food: Jorge Castillo, one of the three men who run the “3 Guys from Miami” Website. Jorge Castillo, along with Raúl Musibay and Glenn Lindgren, have been providing recipes, food descriptions and restaurant recommendations on the Internet for more than ten years. They have even published two cookbooks on Cuban cuisine. And they have been featured several times on the Food Network and the Travel Channel. “If you’ve never had Cuban food before, I recommend you start with a sandwich, maybe a Cuban sandwich or a pan con bistec,” he said. A Cuban sandwich consists of ham, roasted pork, Swiss cheese and pickles between two slices of Cuban bread. The sandwich is then grilled in a Panini press, locally known as la plancha. 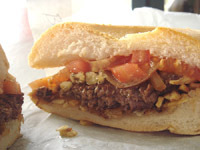 A pan con bistec translates to “bread with steak” and it is essentially a steak sandwich. It consists of a thin piece of steak, grilled onions, shredded lettuce, tomatoes and shoestring potatoes between two pieces of Cuban bread. The sandwich, of course, is grilled in la plancha. Although the bread used for these sandwiches is Cuban bread, Castillo points out that it differs from the loaf you buy in the bakery or supermarket because it is not fully cooked until it gets pressed into a sandwich in la plancha. 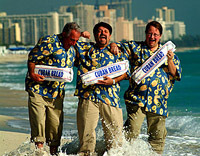 And the reason Cuban bread has such a short lifespan is because it contains no preservatives, he said. In most Cuban restaurants, you will be served a basket of warm buttered Cuban bread if you order a meal beyond the typical sandwich. “Then after you’ve tried the sandwiches, I suggest trying picadillo with tostones or maduros and rice and black beans,” he said. Like many Cuban dishes, picadillo is based on what Castillo describes as the “Cuban trinity”. Castillo, who was born in Cuba, spent 18 years in Iowa, before moving to Miami with his Iowa-born wife, spends his free time trying out various Cuban restaurants throughout town. He is usually not at a loss of words, but when asked what restaurant he would recommend on Miami Beach, he went silent. “Well Casa Lario has good mojitos,” he said. Then he explained that to get the real taste of Cuban food, you must cross the bridge from Miami Beach into Miami. “I prefer those hole-in-the-wall places,” he said. One of these hole-in-the-wall places he recommends is on Bird Road and S.W. 114th Avenue called Ay Mama Inez. Castillo also recommends Miami’s old standbys Versailles and La Caretta, both across the street from each other at Southwest Eight Street (or Calle Ocho) and 35th Avenue. “I like Versailles late at night,” he said. “They have good chicharron de pollo (Cuban fried chicken). The one thing Castillo insists that all tourists try when coming to Miami is Cuban coffee. 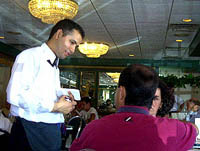 It is also what fuels the conversation at various ventanas (café windows) throughout town, including David’s Café off Lincoln Road in Miami Beach. One taste of that and you will understand why Cubans speak so fast. "Cuban Food Basics You May Not Know"
You know, it’s fascinating to me, as a Cuban-American, I would never even consider comparing Mexican to Cuban food, never mind that what separates the island from that nation is the straight of Yucatan—the cultures could not be more different. Cuban food has a lot of Spanish/African influence as in many Caribbean islands but mainly it consists heavily on starches & legumes. BTW, Cuban bread fresh baked drizzled with olive & oil & a sprinkle of salt is the best! It is very flaky and light—another thing that makes it so delicious. I agree with you, but you don’t know how many people I met when I lived in the Southwest who expect it to the same. I remember telling one lady that my mother was Colombian and she asking me if I my mother had any good “taco recipes”. That’s basically because to the average Anglo (outside of Miami), all Hispanics are Mexicans. Exactly. Not only are all Hispanics Mexicans, but they are Mestizo Mexicans. So many of them, when they come to Miami, are shocked when they see people with blue eyes or even blond hair, speaking better Spanish than English. Mexican food is too spicy for me!!! Another good place just off of SW 8th ST is El Ayestaran. Their Rabo Encendido on Fridays is ALMOST as good as mine. Great intro to Cuban food Carlos but you forgot the breakfast/late night staple: un cafe con leche! The irony of my life is that after living in the Southwest where I got to appreciate good Mexican food (New Mexico has the best, IMO), but ended up missing Cuban food in the process, I moved back to Miami and its Cuban food, only to miss good Mexican food. Maybe the Cuban food article deserves a second installment because I know I only scratched the surface with this article. And forget about a second installment this should be a regular column. Once you’re done with Cuban food, there’s a lot of other Miami cuisine that needs explainin. Cuban food is the best.Is a great type of art,because Cuban food is a piece of art. I was born and raised in Miami, but I’m living in Brownsville, TX. Besides the Cuban desserts and the bread which are the best, Mexican food is by far more delicious, as long as you are in Mexico. The food in Texas and anywhere else in the US that calls itself Mexican is probably going to taste bad. I highly recommend Veracruz, Oaxaca, or Yucatan cuisine, they have food that is divine! It’s the best food in all of the Americas, probably next to Brazilian cuisine. I would would even argue that it’s as delicious as French Italian or Spanish cuisine, but in a different way. If you often hear shouting, panhandling, in proximity of the entrance of food basics, on casselles ST . Please contact # 497-5555 to place a complaint . just maybe he could get psychiatric help. A little understandment towards these sorts of neurotics could form a betterment of intervention, and prevention programs for people with these disorders. The best thing I want to accomplish right now is too get the message across, and get people with these helpless disorders the best help they can receive. In order to get them off the street, so they too can live a normal life. I disagree. I’ve been to El Paso and the best Mexican food is right across the border in New Mexico. I live in Northern Virginia ....And there is no Cuban Food hear ...!!! !....I have to go to Washington D.C…if I want some ...and what I tasted ...Yuk ....Nothing compares to My Mothers Cuban Kitchen ....I miss you Mami..!!!!! It just would have nice to have the recipe for the pictured sandwich!